The 12,000 square foot mission house in Guitton serves as a base for groups participating in service projects. SMI provides ministry opportunities for groups and individuals desiring to spend time in Haiti personally ministering to the Haitian people. For more information on the hosting program see the Mission Hosting information sheet. Interested in bringing a mission team to Haiti? 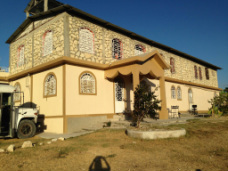 SMI has participated in the construction of mission facilities, churches, schools and homes. Current projects include a church building, a health and education center and a quadruplex of homes in the village of Kamitan. One hundred seventy-five students attend the SMI primary school in Guitton. Student sponsorships provide books, uniforms, and shoes and pay for teachers and staff. The children also receive meals during the school day. Fifty-six students attend secondary school at Reformee in Cepres. Student sponsorships pay tuition for these students. Groups that travel to Haiti with SMI have the opportunity to minister to youth in a variety of settings including, schools, clubs and sports camps. Our women's ministry includes prenatal and newborn care education classes taught monthly by a Haitian nurse and clubs for girls 9-17 years old where the girls are taught, encouraged, loved and prayed for. We also hold conferences for women in the local churches as well as supporting their ministries within the churches. Groups who participate in an SMI hosted mission trip have the opportunity to distribute food and clothing in local villages. The clinics provide the opportunity for medical and support personnel from the States to minister to the physical needs of the Haitian people, most of whom do not have access to heath care or medical facilities.